Alcatel MDR-6000 Repair, 100% Tested, 1-Year Warranty, Unparalleled Free Tech Support, NO Out-of-Box Failures - Period. The Alcatel MDR-6000 is a family of low capacity digital radios available in a multitude of frequency bands from 2 GHz to 11 GHz. They provide solutions for common carrier, private networks and government agencies. The MDR-6000 is available in 2, 4, 8, 12 or 16 DS1, making it ideal for spur routes. 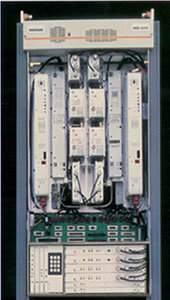 Traffic capacity upgrades are easily accomplished with the replacement of small sub-boards called capacity keys. These radios are available in two modulation schemes: 32 Trellis Coded Modulation (TCM) and 128 TCM. The MDR-6500 Series (32 TCM) is best suited for longer paths as it provides higher system gain. The MDR-6700 Series (128 TCM) is ideal in frequency congested areas when spectral efficiency is needed.